Water-use data for the Colorado River Basin (CRB) Focus Area Study were reported as annual total withdrawals by source , groundwater and surface water of both of fresh or saline quality. Categories of water use include public supply, domestic, commercial, industrial, irrigation, livestock, mining, aquaculture, hydroelectric, and thermoelectric power generation, and wastewater returns. Data also include deliveries from public supply systems for domestic, commercial, industrial and thermoelectric power uses. Consumptive-use estimates are available from 1985-1995 for all relevant categories, and 2010 for irrigation and thermoelectric power uses only. Data were aggregated for 8-digit Hydrologic Unit Code (HUC-8) watersheds within the Upper and Lower Colorado River Basins, at 5-year intervals from 1985 to 2010. The study area includes all of Arizona, and parts of California, Colorado, Nevada, New Mexico, Utah and Wyoming. 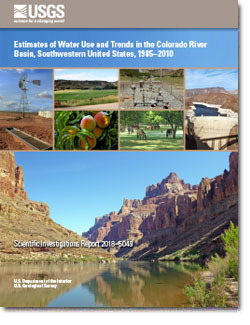 In addition to the water-use data compilations for the 35 years, the USGS collaborated with the Bureau of Reclamation (Reclamation) and produced a USGS report that compares the two agencies’ water-use activities in the Colorado River Basin. This report, jointly authored by USGS and Reclamation, compares and contrasts the two information programs, describing legal drivers for each agencies’ operations, clarifying terminology, comparing and contrasting information, data, and methods used to water use in the basin. Opportunities were identified for continued collaboration between the two agencies to improve the accuracy, timeliness, and delivery of water-use information in the Colorado River Basin, as well as other areas in the western United States where both agencies are active. Water use by category for the Upper and Lower Colorado River Basins in 2010. Total water use, excluding interbasin transfers, averaged about 17 million acre-feet from 1985 to 2010, peaking in 2000 at 17.75 million acre-feet. Water used to generate hydroelectric power represents the majority of total water use, but is an instream use. Irrigation of crops is the largest offstream use of water in the CRB, averaging 85% of total offstream use over the 35-year timespan. Population in the CRB increased from 4.6 million people in 1985, to over 9.4 million people in 2010, and most of the people were in the lower CRB with about 90% in 2010.